Hey Strawberrys! 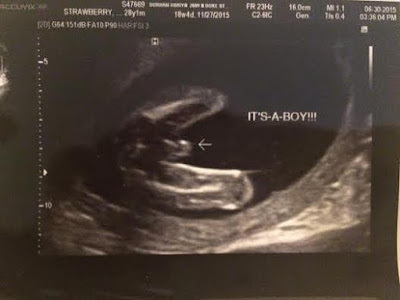 : It's a boy! On June 30th, Brian and I went to our ultrasound appointment and found out we are having a boy! Remember when I wrote about getting Otis and how I prefer girls? It's a boy! (Not sure why the pictures aren't working from my older posts - I'll try to fix that later). I'm experiencing similar emotions. Excitement yet....fear. I'm clueless when it comes to boys. 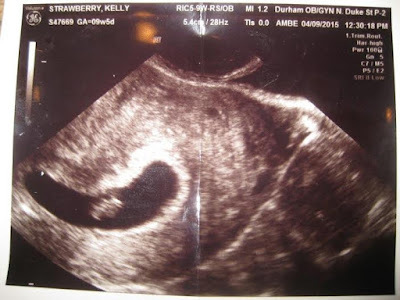 This was my last ultrasound. 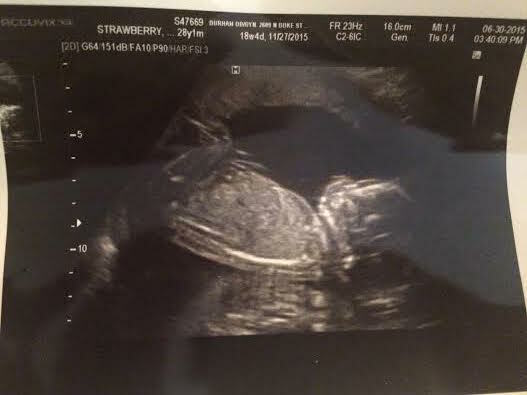 I had one to confirm the pregnancy and this one was an anatomy scan to make sure everything is going well. I suppose I could have an elective ultrasound at one of those 3D places, but those pictures are too weird and alien-like for my taste. It was crazy to see the difference between 6 weeks and 19 weeks (pics below). I can't believe how much this kid is growing, and I still am barely showing now at 21 weeks!! I was reading through my baby book earlier today and saw that my mom gained a whopping 14 pounds when she was pregnant with me. Um, how is that even possible?! She is seriously the tiniest person ever. She also wrote that the doctors and nurses said they should have filmed her as an advertisement for Lamaze, since she had the easiest labor and delivery they had ever seen. Let's hope I get that lucky. There was definitely no denying that we're having a boy. He was very cooperative in revealing his gender. My intuition from the beginning was that we were having a boy, so it didn't surprise me much. I'm glad I found out what we're having because I think it's easier to bond now that I know. I'm not sure what adventure lies ahead of us, but I trust God know's what He's doing in giving us this baby.